Since 1905, the humanities at Cornell have had their home in Goldwin Smith Hall. But many departments were facing a severe shortage of workspaces and classrooms. So for the first time in over 100 years, a new humanities building has opened its doors on Cornell's Arts Quad. 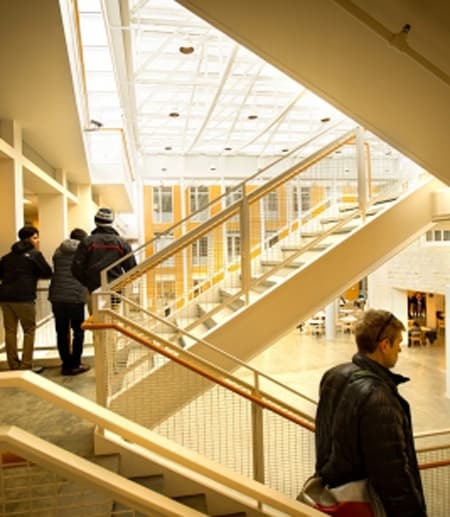 Located between Goldwin Smith Hall and East Avenue, the new building's central atrium serves as a major crossroads for students and faculty from all over campus. The new, environmentally-friendly building is a dominant presence on East Avenue, the main north-south connector for undergraduate students on campus. This spectacular building symbolically and physically welcomes the rest of the campus to participate in the humanities and arts at Cornell. The new building benefits the entire college, with the large auditorium available for classes and lectures across the arts, humanities and sciences, and the new atrium offering a year-round gathering space for the community. We invite you to be a part of this new icon at the heart of the college. Please contact Kat Anderson for information about naming opportunities and other ways to contribute to Klarman Hall; 607-255-8478 or kla77@cornell.edu. Q: Why is the building design so modern? Accepted historic preservation guidelines mandate that new work be differentiated from old. As a United Nations memo details, "contemporary architecture and preservation of the historic urban landscape should avoid all forms of pseudo-historical design, as they constitute a denial of both the historical and the contemporary alike. One historical view should not supplant others, as history must remain readable, while continuity of culture through quality interventions is the ultimate goal." The transparent design of Klarman Hall allows it to honor Goldwin Smith Hall while clearly being of its own historical period. As noted architectural critic Paul Goldberger has said, the design engages Goldwin Smith "in an appropriate formal dialogue" that does not mimic or confuse the original ordering principles of the building, thus successfully meeting the standard for historic preservation. Q: What effect does the building have on the Arts Quad? A: Klarman Hall provides access to the Arts Quad without being visible from the Arts Quad. It is located behind Goldwin Smith on East Avenue, with a roof lower than Goldwin Smith's, an architectural solution that respects the beauty of both Goldwin Smith and the Arts Quad. Q: Is there access between Goldwin Smith and the building? A: Yes, on the ground, first, and second floors. Q: Is there a place to eat in Klarman Hall? A: The cafe at Klarman Hall opens into the atrium in Klarman Hall. This new café location has expanded seating and a barista serving espresso, lattes, and more. Q: How big is Klarman Hall? A: The building is 66,500 square feet; the 33,250 net area includes a 7,700 square foot atrium. In comparison, Morrill Hall has a net area of 32,176 square feet. Q: Who is moving into Klarman Hall? A: Klarman Hall now hosts the College of Arts & Sciences Admissions & Academic Advising Center, along with the Departments of Romance Studies and Comparative Literature. Q: Are there new offices or classrooms? A: The building includes approximately 124 spaces the size of a faculty office. These spaces are organized in groups of three to align with the structural grid of the building and to allow flexibility in converting spaces from one use to another. These modules could include single faculty offices or could be combined to provide department offices, meeting rooms or conference rooms. Q: Will there be anywhere to sit outside? A: On the south side, a ground-level courtyard features seating and a walkway and serves as a gathering spot for quiet outdoor study. On the east side, an exterior promenade runs the entire length of the building, providing extensive tree-lined walking and gathering space. On the north side, a green walkway with a small seating area provides an entrance to the building. Q: When was the building completed? A: The building was completed and opened to the public on January 19, 2016. Q: How was the building paid for? A: The project is being funded through philanthropy.